IndiMix is getting hotter than ever with the dates closing in. 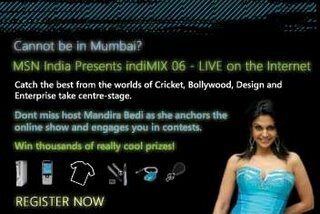 One of the surprise elements is that, Mandira Bedi, renowned Bollywood actor, Anchor (became famous with World Cup 2003 hosting) will be conducting the online show and contests. Apart from this, there are a lot of exciting new features being unveiled during the event including the Expression Designer Suite, the integrated designer tool for developing the next generation rich user experience applications. I will be there in the event and look forward to meeting you all. 3. Register for the Virtual Town Halls whereby you can visit any of the local Microsoft Offices and view the event with a near to real time experience. So, if you have the interest, sky is the limit, with regard to the opportunities to attend this event.